1. LED advertising truck is usually made up of five parts. including large screen system, power supply system, hydraulic system, operating system, car chassis. The power supply is usually 220V, or by self generator. 2. Currently there are mainly two types of LED advertising truck vehicles in China. The external drive type, without independent power, needs the external force pulling to move. Light car type with independent power: there is car chassis, it can change position at will or driving long distance. 3. LED advertising truck is widely used for outdoor commercial advertising, stage rental, traffic advertising, mobile truck advertising, sports stadium advertising etc. 4. One side waterproof P4/P6/P8/P10 full color led screen. The other side advertising light box with subtitle. The rear side monochrome screen to display text. Product Description of FAW brand mobile LED advertising truck manufactured by Chengli Special Automobile Co., Ltd. as below. 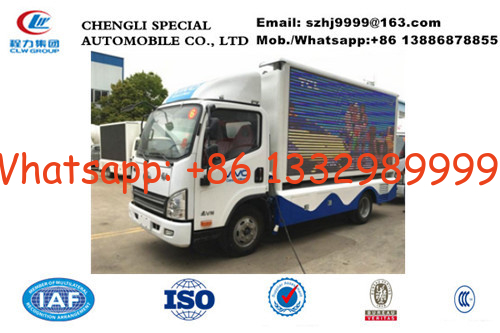 More pictures of hot sale FAW brand P6 mobile LED advertising truck manufactured by Chengli Special Automobile Co., Ltd. as below. 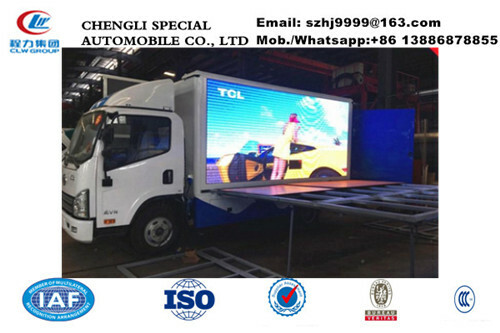 Chengli Special Automobile Co., Ltd. is the leading manufacturer and supplier of Outdoor mobile LED advertising display truck, LED truck, digital advertising truck, LED screen truck, outdoor full color LED advertising truck, LED box truck, etc. 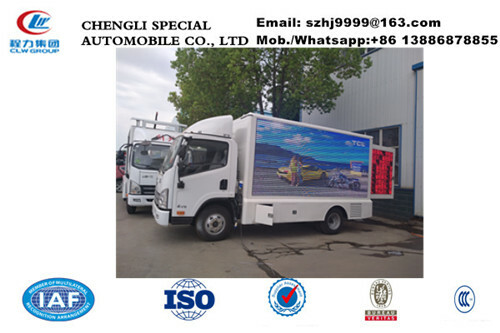 With many years' experience in supplying, Chengli Special Automobile Co., Ltd. could design and produce ISUZU led truck, Dongfeng Outdoor mobile LED advertising display truck, forland digital advertising truck, Karry billboard advertising LED display truck, Chang'an LED display truck, JAC mobile advertising truck, HOWO scrolling advertising truck, trailer-type mobile outdoor LED truck, etc. More information, please feel free to contact with Ms. Anita Deng. The hot sale line is 0086 13886878855.